Here is the links to a China Daily article about Toyota Tsusho which mentions to their cultural activity in China including shogi. The company sees investing in cultural initiatives, aimed at improving relationships and understanding between China and Japan, as a key measure in developing its business in the country. It has recently sponsored a number of programs aimed at fostering cross-cultural wellbeing - including training in how to play the erhu (a traditional Chinese two-stringed lute-style instrument), lessons in Chinese calligraphy and instructions on how to play Shogi (a form of Japanese chess). 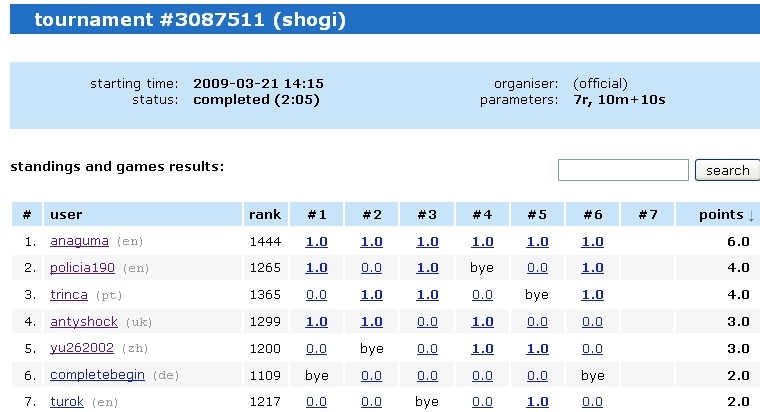 Anaguma is the winner of the captioned on-line shogi tournament held on March 21, 2009. Here is the link to the result. The fifth(final) game.will be held on March 30. The winner of it will be engaged in the Next Kio title holder. And here is the copy of my twitter entries during watching the boardlive games. 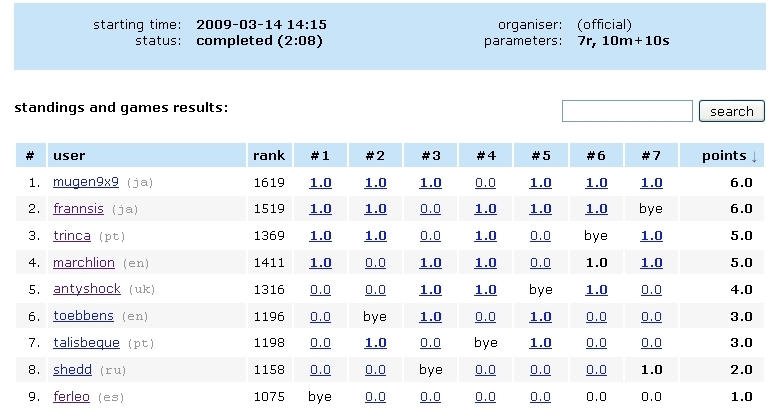 Mugen9x9 is the winner of the captioned on-line shogi tournament held on March 14, 2009. Here is the link to the result. The 2nd game of 1st Tenga-sen between Nakai Hiroe(Joryu 6 dan) and Narita Miho(ama) was held at LPSA's Komagome playing room, Tokyo yesterday. Before the game, Nakai led the score in 1-0. Nakai beat Narita and became the winnner of 1st Tenga-sen. Here is the link for replaying the game. Narita was Sente. On March 12 & 13, the 6th game of 58th Osho-sen 4-win match between Osho Habu and Challenger Oui Fukaura was held at Imaiso in Shizuoka prefecture. Habu was Sente player this game. Fukaura chose B-3c at the 4th move and transferred his Rook to the 4th file in the opening. Fukaura's R-5b at the 16th move was a new move but it did not bear fruits. Habu made Fukaura's attack running out and won the game in 99 moves. The score after this game is tied in 3-3. The final game will take place on March 25 & 26. I got to know this information in Forum Shogi France. There are 47 games available to replay there. 23 for both A & B-classes and one special pair shogi game. The front page column of Mainichi Newspaper which mentioned to Nakahara's retirement has been translated into English to publish on The Mainichi Daily News as below. "When I saw the move, my eyes, for some reason, filled with tears. 'What a lucky guy I am,' I thought," wrote the novelist Sakae Saito in an account of a shogi match he wrote for the Mainichi. It was 1979, the fourth game of the Meijin championship between Meijin Makoto Nakahara and Kioh Kunio Yonenaga. The move, denoted in shogi as S-5g, has since become the stuff of legend, often talked about as a brilliant gambit made in the final stages of the match. "He went out of his way to make a move that allowed his opponent to take his silver general. But because of that, Nakahara's king could not be mated," Saito explained. Nakahara, the 16th Honorary Meijin, is said to have been expressionless as he made the move, after staring at the board for about two minutes. However, he admitted 30 years later that "I played the move thinking that it may make history," at a press conference announcing his retirement from professional shogi. Nakahara beat 15th Honorary Meijin Yasuharu Oyama in 1972 to become the youngest Meijin in history, winning nine consecutive Meijin championships and twice later. He was still recovering after suffering a brain hemorrhage last summer, but after making the decision to end his professional career, he declared, "I have enjoyed competing on the grand stage to the fullest. I have no regrets." Yasuo Harada, a ninth dan (grade) player, describes Nakahara's style as "'Shizen-ryu' that wins the game before anyone knows it." "Shizen-ryu" or "natural style" was the perfect name for a style that appeared rational, effortless, and dignified -- but from Nakahara's point of view, aggressive. "I wouldn't win if I played 'naturally,'" he said. To those of us who watched on the sidelines, his desperate maneuvers were strong enough to seem like they merely flowed naturally. The legendary S-5g is annotated in the video by HIDETCHI. Here it is. Here is the link to the captioned article in The Mainichi Daily News. Makoto Nakahara, a veteran player in professional shogi, announced Wednesday that he will retire at the end of the month. The 61-year-old Nakahara, who is the 16th Honorary Meijin (the most prestigious title in shogi) in the game, had been hospitalized and missed tournaments since he suffered a brain hemorrhage after a match in August last year. "I have been receiving rehabilitation treatments, but it's hard to completely recover," Nakahara said during a press conference in Tokyo's Shibuya Ward. "After a 43-year professional career, I thought it's time to retire." Nakahara, from Shiogama, Miyagi Prefecture, turned professional in 1965 and won his first Kisei title in 1968. After becoming the youngest Meijin in history at the age of 24 in 1972, he won the title nine consecutive times and twice later. In November 2007, Nakahara became the 16th Honorary Meijin. Nakahara, who is known for his own style of playing called "Shizen-ryu," dominated the shogi world by defeating longtime champion and 15th Honorary Meijin Yasuharu Oyama. Nakahara has the third record number of titles, 64, following Oyama's 80 and Meijin Yoshiharu Habu's 71. Nakahara also has the second largest number of wins ever, with 1,308 wins and 782 losses, following Oyama's 1,433 victories. Nakahara served as the chairman of the Japan Shogi Association between 2003 and 2005. "Honorary Meijin" is Mainichi's translation of 永世名人(Eisei Meijin) which I usually translate it as "Permanent Meijin". Only professional players who holds 5 or more terms of Meijin in total will be entitled to be called Eisei Meijin. Meijin title is to be competed annually in the form of 4-win match between the current Meijin and the winner of the top professional players' league called A Juni-sen.